a decoupage from 3D Embroidery sheet #11 "Garden Enchanted". I bought a new embossing folder by Taylored Expressions "Dotted Lattice"it is a very delicate pattern and fits wonderfully with the Spellbinder Boardabilities S5-181. The "Just for You"stamp is by Lili of the Valley. Hobbydots and pearls add a nice finishing touch to the card. the pattern is a691 which can also be purchased separately. This offer is only available from ANN'S PAPER ART WEBSHOP. Ann's Paper Art webshop while stocks last. 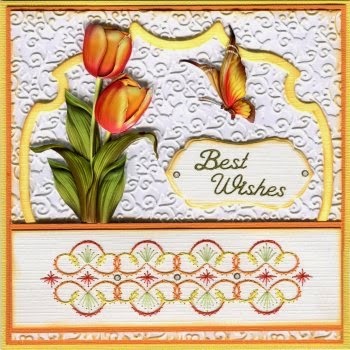 Card by Ann @ Ann's Paper Art. Don't forget that Ann ships world wide. Thank-you for coming by and having a look at the new creations. 3D Decoupage Sheets by Ann's Paper Art. The pattern is available as a download from Ann's Paper Art Stitching Patterns blog. I have completed this card with a beautiful rose from sheet APA3D008 "Orange Roses"
Threads are Mettler Polysheen 1133, 1551, 2830, 2920, 6133. 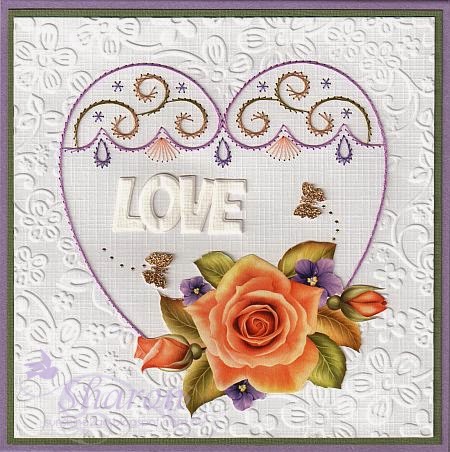 I embossed the background with Crafter Companion Die'sire "Floral Frenzy"
Marianne Design COL1350 was used to create the word LOVE. Punched butterfly and hobbydots have also been added. This birthday card was created from sheet APA3D007 "Colourful Pansies"
Threads are Mettler Polysheen 0700, 2152, 3045, 5833. 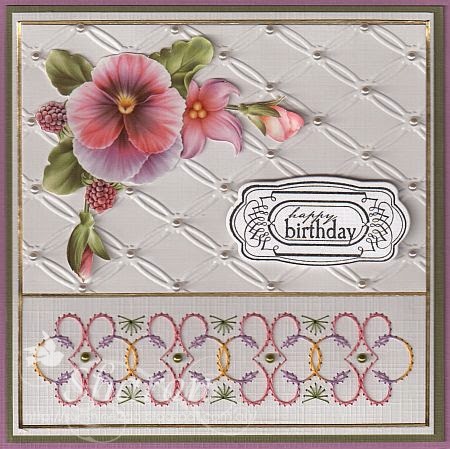 The background has been embossed with Couture Creations "Tied Together"
Happy Birthday stamp and die are both from Whimsy Stamps. Peel off Stickers and pearls have also been added. 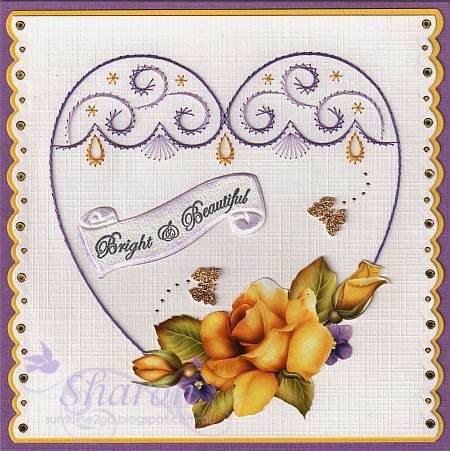 I look forward to creating many more cards with these beautiful decoupage sheets. Thank-you for coming along and having a look at my creations. Ann's Paper Art Stitching Patterns blog. 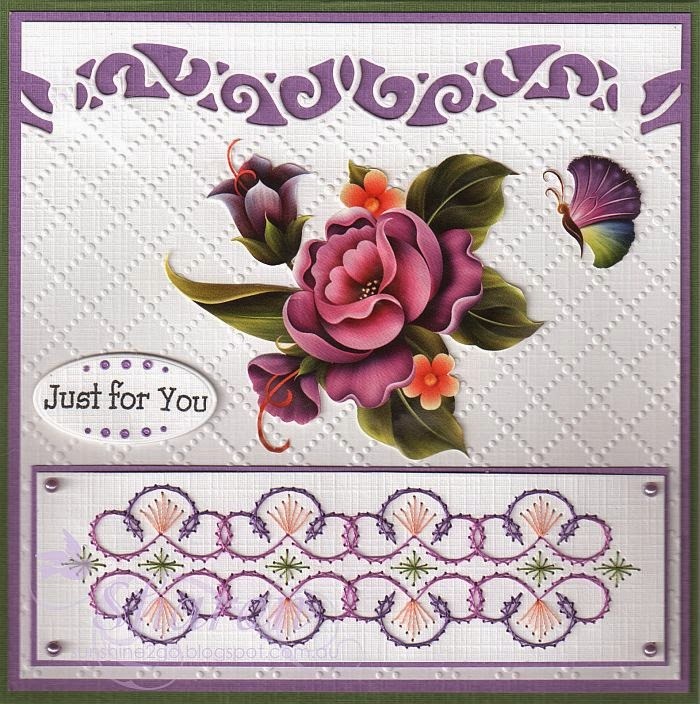 I created this card with APA3D008 which comes with 3 sets of beautiful roses. 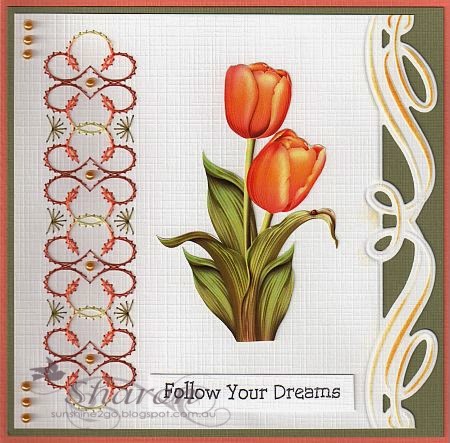 Tulips are also a favourite of mine, this lovely orange Tulip is from sheet APA3D006. There are 3 sets of beautiful Tulips on the sheet. You can use the 3D decoupage sheets for any occasion. Don't forget to go to the other team members from Ann's Paper Art and take a look at what they have created with the 3D Decoupage sheets.